Universal Studios’ animated film production company Illumination Entertainment owes its early success to their first motion picture, 2010’s Despicable Me, and their continued prosperity to the 2013 sequel, Despicable Me 2. Animation guru Chris Meledandri’s studio dips into that franchise again, expecting huge dividends on the bankable name of the lovable minions in the prequel-spinoff Minions. If people didn't buy a ticket to catch the side-splitting vocal performance of comedy icon Steve Carell as the despicable “Gru” in the Despicable Me movies, then chances are he or she was there to watch the amusing, laughable antics of Gru’s loyal, banana-crazed, pill-shaped minions while they carry out his evil schemes. While audiences won’t regard the newest Illumination film in as high esteem as the original, Minions proves to be the funnier, more accessible film for children and families this summer. It’s really nothing more than yellow blobs speaking some sort of gibberish/ every language patois, but it jives. Pierre Coffin (co-director of both Despicable Me pictures) co-directs Minions with Kyle Balda (co-director of The Lorax). Coffin also provides the voice for each and every minion on- and off-screen, including the three protagonists: adventurous Kevin, rebellious Stuart, and eager, little Bob. Through narrator Geoffrey Rush’s (the Pirates of the Caribbean franchise, The King’s Speech) disarmingly hilarious opening monologue, Coffin and Balda establish the evolution of the small, loyal creatures who would one day work for Gru in a montage covering the dawn of the planet all the way up to 1968. Minions need to serve an evil master to carry out their bidding—it’s in their biology—and when we see them in the late sixties, they haven’t followed a boss for quite some time as Kevin, a particularly ambitious minion, leads a small expedition comprised of Stuart, Bob, and himself in search of a new leader. The minions hear of a convention in Orlando, Florida, for villains and take a road trip. This is where the rest of the voice cast can be heard. Oscar-nominee Michael Keaton (Birdman, The Other Guys) and Allison Janney (Spy, Away We Go) provide the parental voices for an unfortunately under-utilized bank-robbing family. 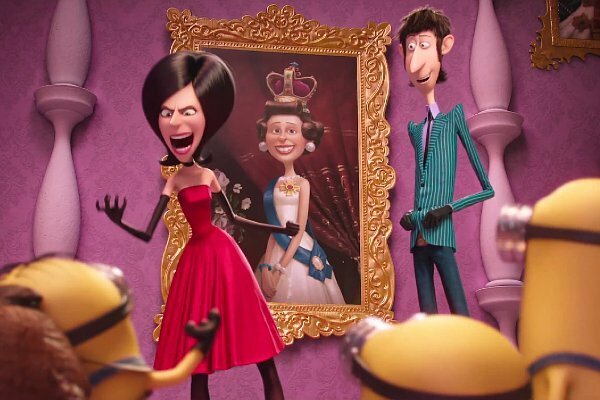 Academy Award-winner Sandra Bullock (The Blind Side, Gravity) voices a super-villain the minions look to one day serve, Scarlet Overkill. She isn’t given as many jokes in the script as her husband, the evil inventor Herb Overkill (Jon Hamm—“Mad Men,” Million Dollar Arm), who creates all of Scarlet’s weapons and maintains a dungeon for torturous purposes. The minions will have to prove themselves to the Overkills, but are they up to the task? While other animation studios have been criticized as “low-brow” for not shooting for the highly conceptual, tear-jerking comedy-dramas that Disney-Pixar produces, the Despicable Me franchise achieves a certain satisfaction for all demographics in the crowd and never alienates the target child audience. Minions keeps this rhythm going for Illumination Entertainment, providing humor for younger family members and their parents. Everybody loves minions and adults will enjoy the sixties motif and soundtrack. Universal’s newest cartoon may not teach the emotional lessons learned in the newest Pixar film, but it also doesn’t latently teach children that running away from home in one of the world’s biggest cities will turn out okay in the end as demonstrated in Inside Out. At least the minions travel with a buddy (or two).